Picturesque makes images gorgeous for your website. 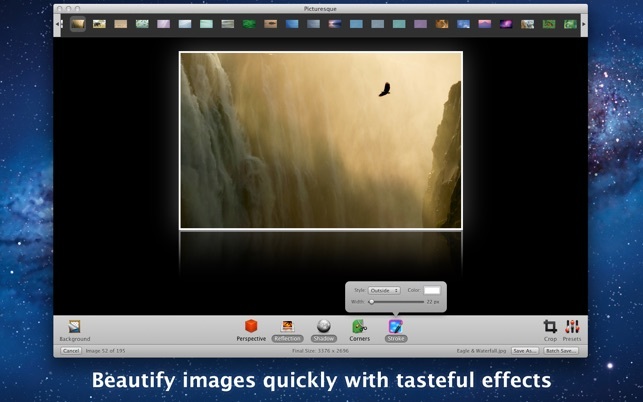 Drag and drop images onto Picturesque, and choose from among Picturesque's 5 tasteful effects. All Picturesque's effects work well together, and are widely used around the web to make images more beautiful. It's the perfect tool for web designers and bloggers. Update for compatibility with 10.14 Mojave, and Dark mode. Great app, that does exactly what it promised. I have been using this app for years, and it does exactly what it's supposed to do. 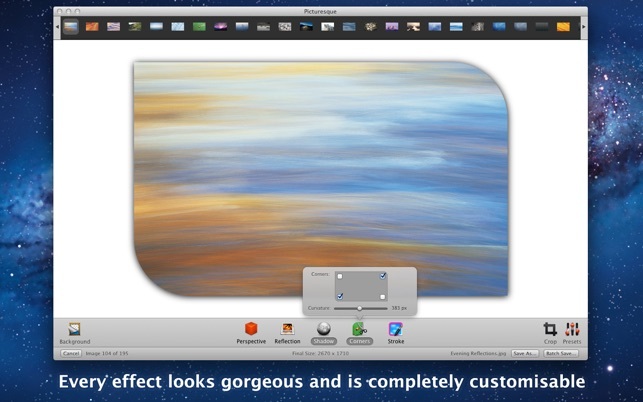 It's not a Photoshop or even Pixelmator replacement, it's an app for quickly adding certain effects. Play around with the different sliders and options, and you will be surprised how easy it is to add borders, reflections, perspectives, and shadows. You can also combine effects easily. Of course you can do these effects yourself with other apps, but it is a much more involved process. 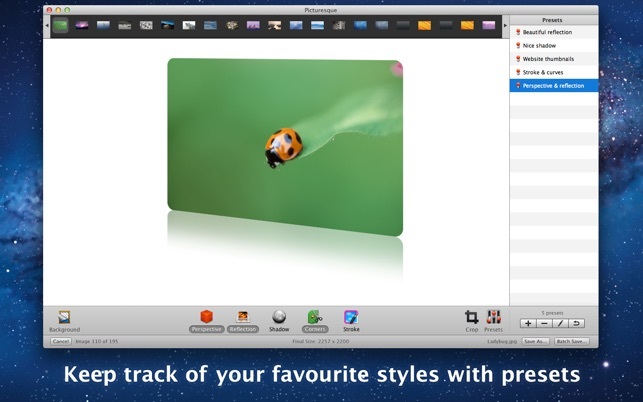 Picturesque is all about making it fast and easy, even for an absolute beginner. The "killer" feature of Picturesque is "Presets". Once you have an effect or combination of effects you like, you can save it to use over and over again. I use it for web design and I can't even calculate how much time it has saved me. 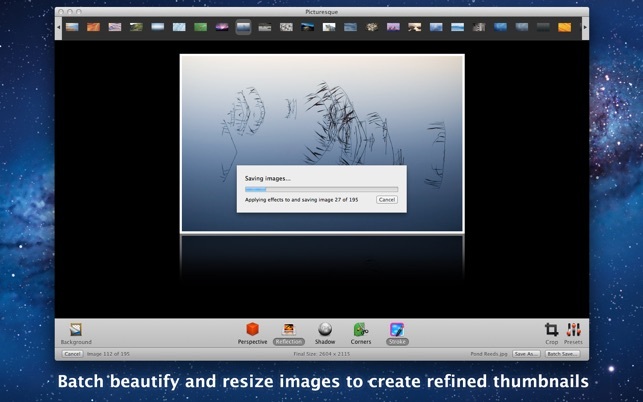 Although this product has received some negative reviews, I have to say that it is exactly what I was looking for: a simple program to quickly add basic effects to screen shots for use in Keynote without having to use Photoshop. This program is super easy to use and quickly produces the revised graphic I need - including letting me scale the screens to a more presentation-friendly size. It reminds me of an old program which was in my graphics toolbelt for years: Graphic Converter. Thank you Acqualia for making a simple graphic utility that avoids the pitfalls of featuring up too much. I agree with the other positive reviews. This app does exactly what it says it will do, and what the screen shots indicate. I needed something to quickly make some images look jazzed up for a web page. In my case I wanted reflection and could not get that in Aperture. So I picked up this app, dropped my images in, adjusted them to the same size (very quickly) and added a reflection to them, and saved them. Took about a minute. I got exactly what I wanted, quickly.